The advanced energy industry employed just over 3.5 million U.S. workers in 2018, an increase of 125,000 jobs over 2017. Advanced energy employment grew 4% last year, more than twice as fast as overall U.S. employment growth, at 1.5%. And the growth continues: Employers expect to add 6% more advanced energy jobs in the coming year. These are some of the findings derived from the 2019 U.S. Energy and Employment Report (USEER), produced by the Energy Futures Initiative (EFI) in partnership with the National Association of State Energy Officials (NASEO), using data collected and analyzed by BW Research Partnership. Want more proof that advanced energy is a major source of employment? 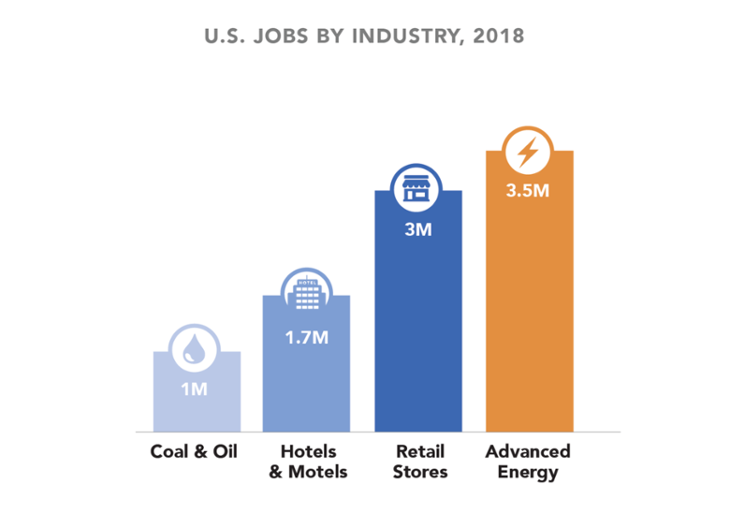 Comparison to other significant U.S. industries might help.At 3.5 million jobs, advanced energy employs more U.S. workers than retail stores (3 million), twice as many as hotels and motels (1.7 million), and more than three times as many as the coal and oil industries combined (1 million), according to the Bureau of Labor Statistics (retail and hotel/motel) and USEER (coal and oil). The greatest number of advanced energy jobs – 2.3 million – can be found in energy efficiency, working to make buildings and appliances use less energy. Energy efficiency employment grew 3% last year, adding 76,000 jobs. The fastest employment growth was in advanced vehicles, at 15%. Of the 253,000 total jobs, 120,900 are associated with plug-in hybrid and all-electric vehicles, which grew 25%, and 110,300 with hybrid vehicles, which grew 10%. Employment in energy storage increased 14%, to 74,500. Employment in advanced energy generation – which includes solar, wind, hydro, combined cycle natural gas, and nuclear power – totals 695,000 jobs, down 1% from 2017. Solar employment dropped 4% but at 335,000 still made up nearly half of advanced generation jobs. Wind energy jobs grew 4%, to 111,000 while natural gas electric generation jobs went up 7%, to 69,000. Bio-energy and Combined Heat & Power added 2,500 jobs, to 42,000, for growth of 6%. Jobs in advanced fuels – which include corn ethanol, biofuels, biomass, and nuclear fuel – increased 11%, totaling 116,000. What does the advanced energy workforce look like? As an industry, advanced energy is still mostly male: 70% of advanced energy workers are men, compared with 53% of all U.S. workers. In terms of diversity, the picture is more mixed: Latinos make up 20% of the advanced energy workforce (up from 18% from a year ago), slightly higher than the U.S. average of 17%. African Americans account for 8%, well below the U.S. average of 12%, while Asian Americans make up 9%, compared with 6% of all U.S. jobs. Some 10% of advanced energy workers are veterans of the military, compared with 6% of all U.S. workers, and 7% are union members, compared with 11% of U.S. workers overall. Jobs are not the only way the advanced energy industry is growing. Stay tuned for the 2019 edition of our Advanced Energy Now Market Report, with U.S. and global revenue from 2011 to 2018 and key trends driving advanced energy growth, coming soon. Our 2017 edition showed advanced energy to be a $1.4 trillion global industry, generating $200 billion in revenue in the United States. For now, take in the reality of advanced energy as a job machine.